Pre-built integration makes it faster and easier for Demandware clients to deploy Bongo’s InternationaleCommerce Solutions. “As our clients expand to meet global demand, companies like Bongo can help them achieve success." 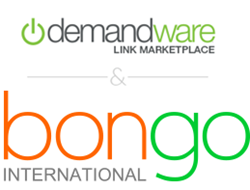 Bongo International, International eCommerce Solutions for Businesses, today announced that it has become a Demandware LINK Technology Partner, joining a best-of-breed community committed to accelerating the adoption of innovative commerce technologies that are complementary to the Demandware® Commerce platform. Through the LINK Technology Partner Program, Bongo International has developed a pre-built cartridge integration with all three of the Bongo offerings. This includes, Bongo’s Extend, Checkout, and Export International Business Solutions. These Cross Border Enablement (CBE) solutions make it possible for Demandware clients to implement Bongo’s International Fulfillment solutions in a fraction of the time normally required. Bongo’s Demandware integration enables retailers’ eCommerce sites to accept international transactions from over 220 countries without having to manage the common challenges associated with Cross Border eCommerce. Every international order gets shipped to one of Bongo’s US destinations where it is processed for export abroad. The Demandware LINK Technology Partner Program provides Demandware clients with a rich set of pre-built integrations to cutting-edge commerce technologies and applications that can unlock revenue generating opportunities and enhance the brand experience. By reducing the cost and complexity of integrations, Demandware LINK allows retailers to adopt innovative third party technologies quickly and cost-effectively, allowing them to accelerate time to market and realize a faster return on their investment. “We are very excited to collaborate with Demandware as a certified LINK Technology Partner. Our partnership will empower Demandware clients with turnkey solutions for accepting global orders in a competitive ecommerce market,” Jennean Morrison, Director of eCommerce.